How can advanced practice doctorates contribute to knowledge building and the bridging of research/practice gaps? What are the lessons that can be learned from the implementation of advanced practice doctoral programs in Psychology, Nursing and Occupational Therapy? What are the similarities and differences among the advanced practice doctoral programs at University of Pennsylvania, University of Tennessee and Rutgers University? 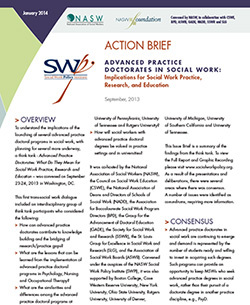 How will social workers with advanced practice doctoral degrees be valued in practice settings and in universities? It was co-hosted by the National Association of Social Workers (NASW), the Council on Social Work Education (CSWE), the National Association of Deans and Directors of Schools of Social Work (NADD), the Association for Baccalaureate Social Work Program Directors (BPD), the Group for the Advancement of Doctoral Education (GADE), the Society for Social Work and Research (SSWR), the St. Louis Group for Excellence in Social Work and Research (SLG), and the Association of Social Work Boards (ASWB). It was also supported by Boston College, Case Western Reserve University, New York University, Ohio State University, Rutgers University, University of Denver, University of Michigan, University of Southern California and University of Tennessee. Review the full report and action brief.